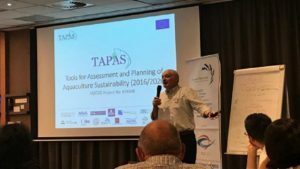 A fundamental part of the TAPAS project is engaging with the aquaculture industry to ensure TAPAS is addressing relevant issues and suggesting and providing usable tools and methods. The Annual General Meeting of the European Aquaculture Technology and Innovation Platform (EATIP), which was held in Brussels was an excellent opportunity to meet with a range of stakeholders from across the aquaculture value chain. During the meeting, TAPAS coordinator Trevor Telfer presented an overview of the TAPAS project’s progress to date and some preliminary results. The European Aquaculture Technology and Innovation Platform is an international, non-profit associated that is developing, supporting and promoting aquaculture in Europe, and specifically technology and innovation. EATIP includes members of the European aquaculture value chain from suppliers and producers to processors as well as leading research groups and key representative organisations.